Elin Nordegren told her side of the story and now Tiger Woods has his turn. What did Tiger Woods say? Elin Nordegren broke her silence to People magazine, just days after her divorce to Tiger Woods was final. She was candid about her relationship with Woods and what led to their divorce. The Swedish-born beauty told People she “had been through hell” and revealed she “never suspected” Woods was cheating. With every side comes the flip and Tiger Woods took his own chance to address the scandal that not only took down his marriage but his golf game as well. The world’s most famous golfer spoke candidly after his practice round at The Barclays tournament in Paramus, addressing both his life on the golf course and off. The Barclays event will be Tiger Woods’ first tournament since his divorce with Elin Nordegren was finalized August 23. “It’s a sad time in our lives. And, you know, we’re looking forward in our lives to how we can help our kids as best we possibly can. That’s the most important thing,” Tiger Woods expressed to reporters about his children with Elin Nordegren. Tiger Woods has struggled with his golf game since April. The dynamic pro admitted it isn’t easy to focus on golf given his personal problems. Tiger Woods also addressed any regrets he has in regards to his admitted infidelity and divorce. Tiger Woods does admit he has found some positive light in regards to the highly public Thanksgiving car crash that sent his life into a spiral. 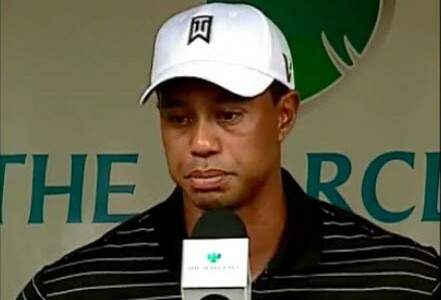 Tiger Woods dated LeAnn Rimes?